<>Praise for the second edition of The Design of Sites "In my worldwide IBM marketing role, I have the benefit of working with some of the finest international interactive agencies and internal Web teams. As I read The Design of Sites, [I see] the insight from years of professional advice has been put to paper. Nowhere have I seen such a practical, effective, and easy-to-use book to solve and avoid Internet design issues. I keep a copy of the book handy to remind me of the things I forgot and to gain fresh perspectives. It never fails to deliver. "-John Cilio, marketing manager, IBM System x & z Storage Synergy "The Design of Sites artfully brings forward the original intent of Christopher Alexander's pattern language into the user experience design arena. It is a valuable and comprehensive reference. "-George Hackman, Jr., senior director of User Experience for User Interface Guidelines, Patterns and Standards, Oracle Corporation "The Design of Sites is one of the best tools I have in my usability toolbox. [These] Web UI design patterns make it easy for me to show my clients how to get the most usability bang for their buck. "-Claudia Alden Case, usability consultant and interaction designer, Alden Case Enterprises, Inc. "If only biology class had been like this. Lucid text, bulletproof content, and a comprehensive taxonomy that's just as much a source of inspiration as it is a production tool. This is a really, really good book. If you build Web sites, read it. "-Marc Campbell, author of Web Design Garage Praise for the first edition of The Design of Sites"Stop reinventing the wheel every time you design a Web site! The Design of Sites helps you rethink your Web sites in terms of genres and patterns. Once you have identified the patterns and applied the best practices for those patterns as outlined in this book, you will reduce your design effort by 50 percent . . . at least! "-Pawan R. Vora, vice president, Information Architecture, Seurat Company"The content [in The Design of Sites] could make a novice into a seasoned professional over a weekend. Many companies pay a fortune for the information contained in the book's primary chapters. "-John Cilio, marketing manager, IBM System x & z Storage Synergy"This book has many handy checklists for what you should and should not do in creating a conventional Web site. Just following the authors' suggestions would put your site in the top few percent for readability and usability. "-Jef Raskin, creator of the Macintosh computer and author of The Humane Interface"Now that The Design of Sites has made its appearance, we won't have to put up with those poorly designed Web pages. These authors have captured patterns from successful Web designers, including their own experience in consulting and teaching, and have made this information accessible to all of us. The book is readable yet full of worthwhile information--a valuable addition to any Web designer's bookshelf. "-Linda Rising, independent consultant and author of The Patterns Handbook, The Pattern Almanac 2000, and Design Patterns in Communications Software"[The Design of Sites] bridges the gap from theory to practice and makes it possible for people in the Web-design space to use user-centered design principles in their work-without having to undertake extensive training. "-Maya Venkatraman, human interface engineer, Sun Microsystems"The coverage [in The Design of Sites] is excellent--issues go beyond the traditional `design the best page' focus and do a good job of showing the context. I haven't seen any other book with the kind of breadth this has. "-Terry Winograd, professor of computer science, Stanford University, and editor of Bringing Design to Software"With this book as a reference, you can benefit from what companies like Yahoo! have learned and apply it to your site, even if you don't have a design and research team similarly sized and staffed. "From the foreword by Irene Au, director of User Experience, Google; former vice president of User Experience and Design, Yahoo! 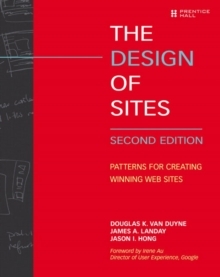 The Design of Sites, Second Edition, is the definitive reference for the principles, patterns, methodologies, and best practices underlying exceptional Web design. If you are involved in the creation of dynamic Web sites, this book will give you all the necessary tools and techniques to create effortless end-user Web experiences, improve customer satisfaction, and achieve a balanced approach to Web design. After a comprehensive tutorial covering the foundations of good Web site design, you will move on to discover the thirteen major Web design pattern groups. These patterns solve recurring design problems and help design teams avoid reinventing the wheel.